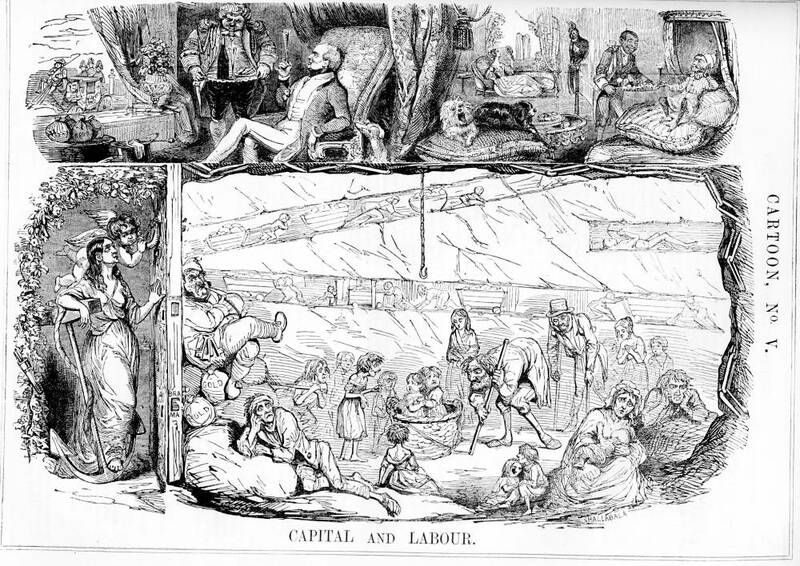 Capital and Labour, drawn by Robert Jacob Hamerton, who sometimes used the penname Shallaballa, seen near the lower righthand corner (12 August 1843), Vol. 5: 48-49. Punch; or, The London Charivari 17.7 cm high by 24.3 cm wide. Original Editorial Commentary for "Capital and Labour. Cartoon No. V."
The cartoon, the fifth "Mr. Punch's Big Cut," appears to have been at least partly inspired by a recent parliamentary report on child labour, The First Report on Children in Mines (May 1842), which the magazine's editorialist refers to as "Mr. Horne's Report." Its principal author, Richard Hengist Horne (1802-1884), although a Sandhurst graduate, never received a military commission, and became a journalist instead. After participating in a number of foreign military campaigns, including the Mexican War, he returned to England in 1827 and took up literature, being variously a newspaper writer and poet. Despite his lack of political background, he was appointed to the Parliamentary Commission of Inquiry into Children's Employment in mines and factories. Horne as a subcommissioner for England with the Astley Commission produced two reports on child labour. The First Report on Children in Mines (May 1842) led to Parliament's legislating against the employment underground of all females and of boys under ten years of age. The Second Report, which considered the conditions of children employed in trades and manufacturing, was based on some 1,500 interviews of child workers. Shedding light upon the extremely dangerous working conditions in the factories (where children would customarily crawl under the machinery while it was running in order to clear away cotton threads), it directly led to the 1844 Factory Act. 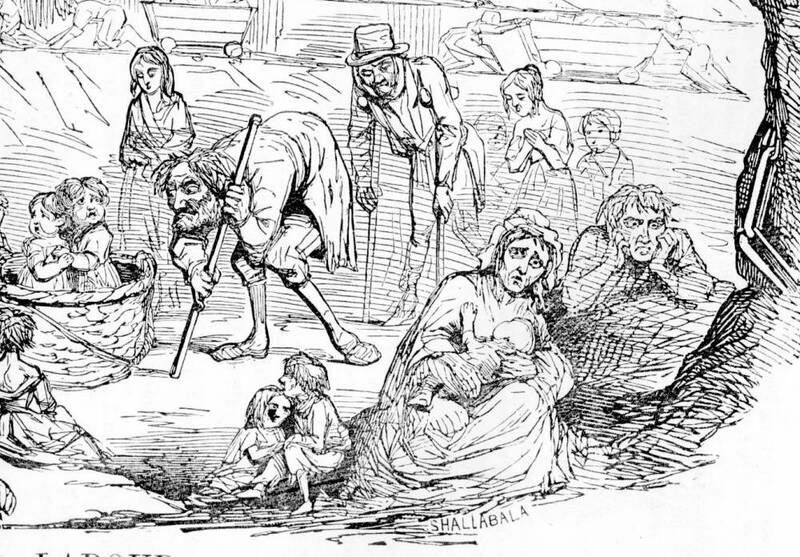 It is noteworthy that the cartoon features children working in coal seams, another extremely dangerous rather than merely an uncomfortable form of child labour, and that the children in Leech's celebrated Ignorance and Want in A Christmas Carol (1843) are standing in front of what appears to be a factory. Leech, John. Substance and Shadow. Punch; or, The London Charivari. 5 (15 July 1843): 22-23. 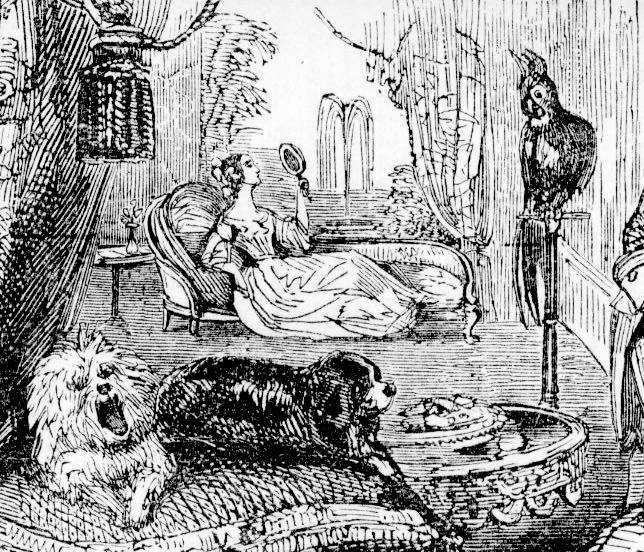 "Shallaballa" (R. J. Hamerton). Capital and Labour. Punch; or, The London Charivari. 5 (12 August 1843): 48-49.